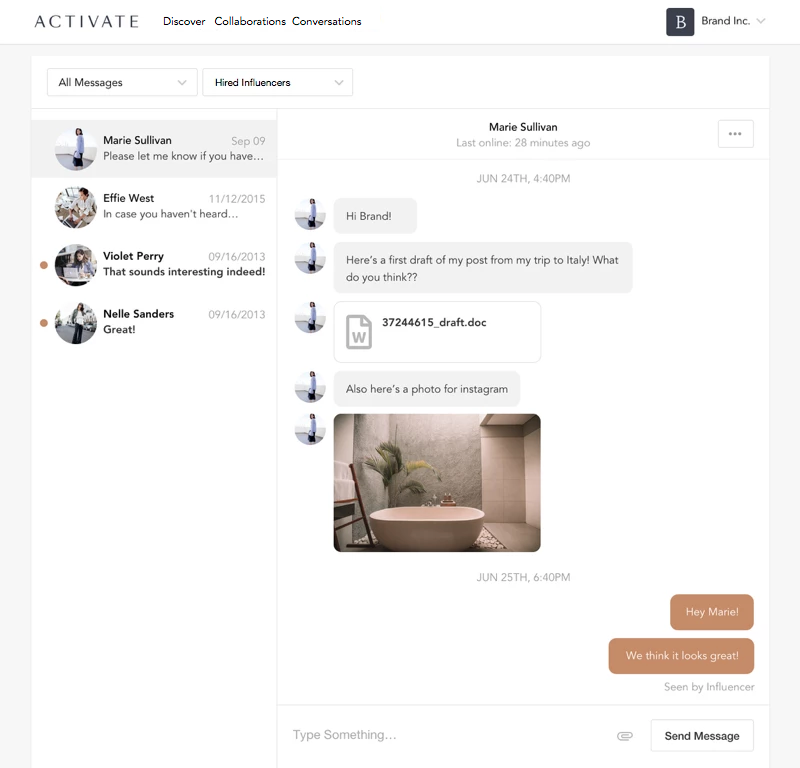 We built ACTIVATE after working on hundreds of collaborations manually and understanding the key pain-points to scaling influencer activations. 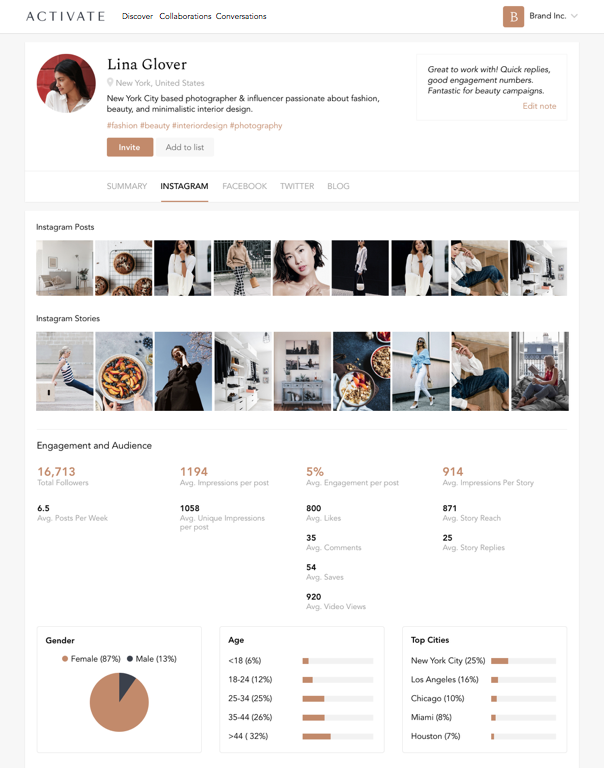 Our three core product offerings will help you scale and grow your influencer collaborations easily and build long-lasting relationships with influencers. Learn more about ACTIVATE Insights, Workflow, and Discover below. Monitor and track real-time activity. Understand your impact and scale it across different platforms. Get content performance reports on Blog, Facebook, Instagram, IG Stories, IGTV, YouTube, Pinterest, and Twitter! Use our beautiful charts for your reports or export the collaboration CSV to create your own. We also offer an API for clients who would like to integrate deeper with our platform. We're always innovating to make sure you can continuously launch creative collaborations. Streamline your Instagram Stories & IGTV reporting by receiving metrics right on the ACTIVATE platform. 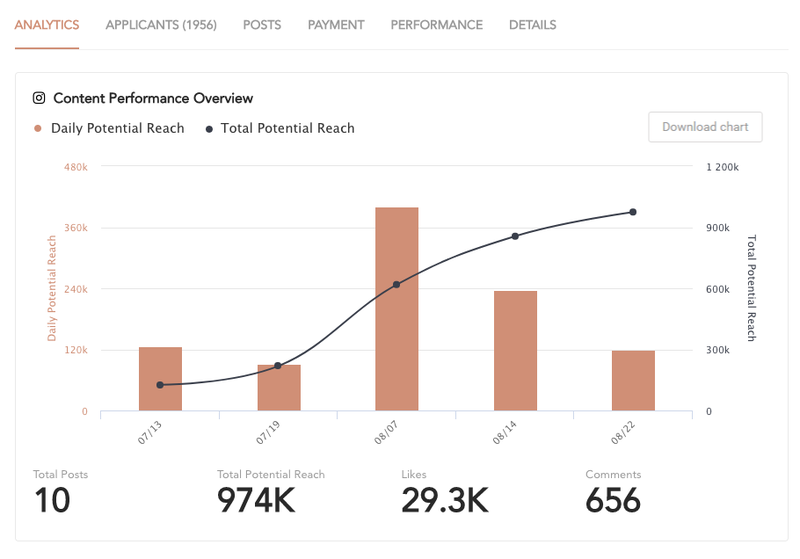 Efficiencies in influencer discovery and workflow allow you to focus on what's most important: developing the brand/influencer affinity and collaborating on content strategy. Our content review allows influencers and brands to easily upload multiple file types and easily circulate content revisions. Track all drafts and revisions - nothing goes live until it has your seal of approval. Easily communicate with your influencers with our universal messaging feature. Interchange all types of documents - images, videos, PDFs, the works. Running multiple collaborations with different campaign managers all at once? 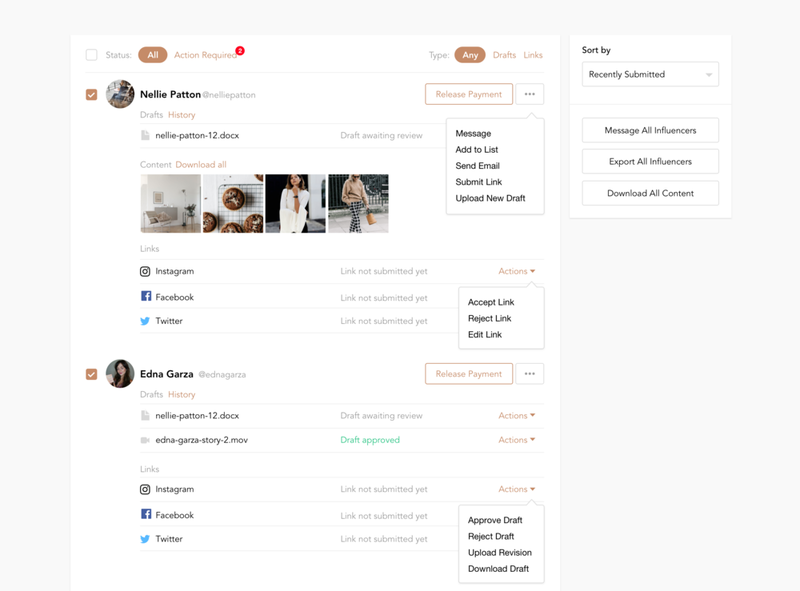 Filter by your different collaborations to streamline your communication. Our universal messaging platform will scale with you as your team grows. 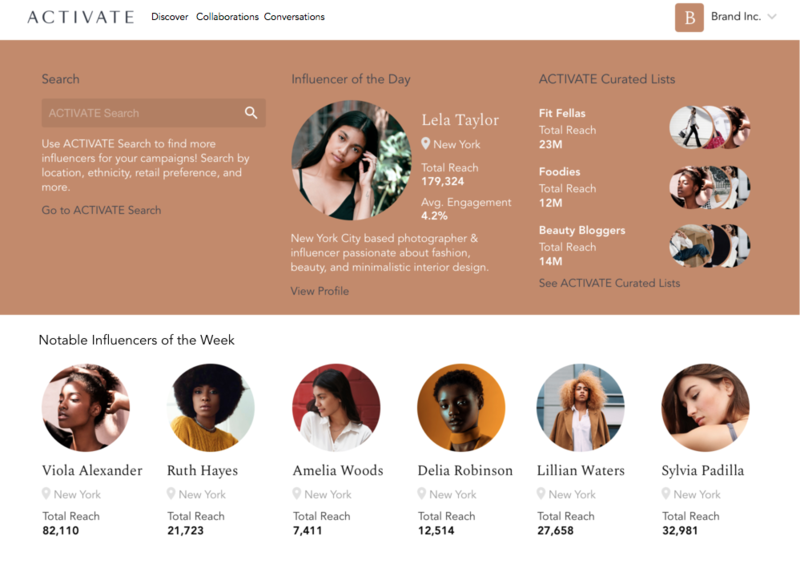 ACTIVATE Discover is here to streamline your influencer selection process. We’ve combined our search engine with expertly curated lists to help you find the perfect influencers for your next collaboration. Discover fresh and new creators everyday who would be a great fit for your brand. Our Curated Lists feature thousands of influencers that have been carefully hand-selected by the ACTIVATE Studio Team based on various criteria, including content quality, performance, and professionalism. We have the world’s largest opt in network of over 150,000 quality creators -- this means the ability to ramp up large activations while truly maintaining quality. We pride ourselves on true diversity of network, in terms of tiers (celeb to nano), ethnicity, geography, and areas of influence -- as demonstrated by micro-networks ranging from ‘Sneakerheads’, ‘Cool Moms’, and ‘Yogis and Vegans’, as well as the ability to cast talent based on real life relevancy factors: Key Life Moments, Video or On-Air Hosting Experience or Advocates/Caretakers for specific conditions. Our proprietary platform and network allows you to identify and vet creators based on qualitative and quantitative criteria such as key life moments, personal experiences, retailer and brand affinity, psycho-graphic interests, audience demographics & geography and more! Each influencer profile is filled with samples of their content, past work, and deep metrics. Influencers also share their favorite brands with whom they'd love to work. See influencers' past and past partnerships to get a feel of their aesthetic and creativity. ACTIVATE is one of the most elite influencer marketing platforms out there, with the best analytics and a real opt-in influencer network. Every program we have launched has received hundreds of excellent creator applicants.